Name Variation Frederick Steckelberg was also known as John Fred. Name Variation Frederick Steckelberg was also known as Fred. Frederick Steckelberg was born on 23 January 1858 at Hanover, Germany. He married Augusta Wilhelmina Uphoff before 1882. Frederick Steckelberg married Marie Schultz circa 1904 at 2nd marriage for both. Frederick Steckelberg died on 4 July 1935 at killed by train, Sauk, Wisconsin, at age 77. He was buried on 7 July 1935 at St John Lutheran Church, Reedsburg, Sauk, Wisconsin. On 29 June 1923 Viola Niemann is visiting her grandparents, F. H. Steckelberg, at Reedsburg. 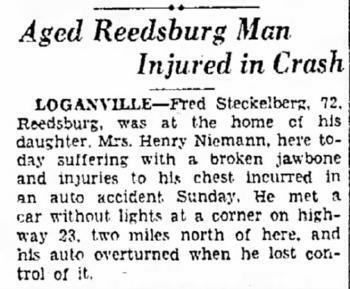 On 10 March 1930 Fred Steckelberg, 72, injured. Name Variation Marie Schultz was also known as Mary. Married Name circa 1904 As of circa 1904,her married name was Steckleberg. Marie Schultz was born on 15 November 1859 at Germany also reported as 1861. She married Frederick Steckelberg circa 1904 at 2nd marriage for both. Marie Schultz died on 14 November 1928 at Dane, Wisconsin, at age 68. Martin Henry Steckelberg was born on 29 July 1895 at Sauk, Wisconsin. He was the son of Frederick Steckelberg and Augusta Wilhelmina Uphoff. Martin Henry Steckelberg witnessed the marriage of August Steckelberg and Martha E. Gade on 29 September 1912 at St John Lutheran Church, Reedsburg, Sauk, Wisconsin. Martin Henry Steckelberg married Meta E. Gade, daughter of Henry Gade and Sophia Buhr, on 20 December 1916 at St John Lutheran Church, Reedsburg, Sauk, Wisconsin. Martin Henry Steckelberg died on 27 January 1971 at Wood, Wisconsin, at age 75. Name Variation Augusta Wilhelmina Uphoff was also known as Gusta. Name Variation Augusta Wilhelmina Uphoff was also known as Augusta Alphoff. Married Name before 1882 As of before 1882,her married name was Steckelberg. Augusta Wilhelmina Uphoff was born on 27 May 1865 at Sauk, Wisconsin. She married Frederick Steckelberg before 1882. Augusta Wilhelmina Uphoff died on 10 July 1901 at Sauk, Wisconsin, at age 36. Edwin Steckleberg was born on 8 June 1890 at Sauk, Wisconsin. Edwin Steckleberg died in 1890. August Droes married Caroline Wilhelmina Lindert. August Droes was born on 16 October 1853 at Germany. He died on 5 July 1905 at Sauk, Wisconsin, at age 51. Name Variation Caroline Wilhelmina Lindert was also known as Minnie. Married Name Her married name was Droes. Caroline Wilhelmina Lindert married August Droes. Caroline Wilhelmina Lindert was born on 18 October 1857 at Germany. She died on 17 December 1925 at Sauk, Wisconsin, at age 68. Raymond Struck was born in 1904. He married Aurella Anna Bertha Droes, daughter of Frederick William Droes and Alma Emma Luehrsen, on 30 October 1932. Raymond Struck died in 1986. Doris Ona Thompson married Amos Theodore Droes, son of Frederick William Droes and Alma Emma Luehrsen. Doris Ona Thompson was born on 28 October 1911 at Dane, Wisconsin. She died on 8 July 2000 at Seattle, King, Washington, at age 88. Married Name 20 December 1916 As of 20 December 1916,her married name was Steckelberg. Meta E. Gade was born on 10 November 1899 at Sauk, Wisconsin. She was the daughter of Henry Gade and Sophia Buhr. Meta E. Gade witnessed the marriage of August Steckelberg and Martha E. Gade on 29 September 1912 at St John Lutheran Church, Reedsburg, Sauk, Wisconsin. Meta E. Gade married Martin Henry Steckelberg, son of Frederick Steckelberg and Augusta Wilhelmina Uphoff, on 20 December 1916 at St John Lutheran Church, Reedsburg, Sauk, Wisconsin. Meta E. Gade died on 21 July 1968 at Sauk, Wisconsin, at age 68. Meta E. Gade was confirmed on 31 March 1912 at St John Lutheran Church, Reedsburg, Sauk, Wisconsin. 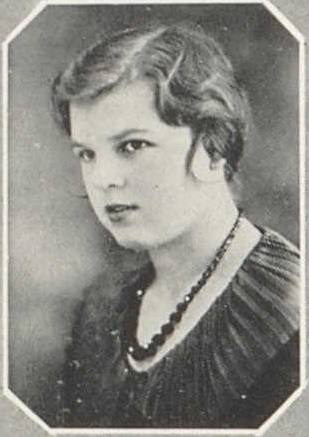 Viola Niemann was born circa 1913. She was the daughter of Henry George Niemann and Emma Dorothea Steckelberg. As of 1954, Viola Niemann was never married. 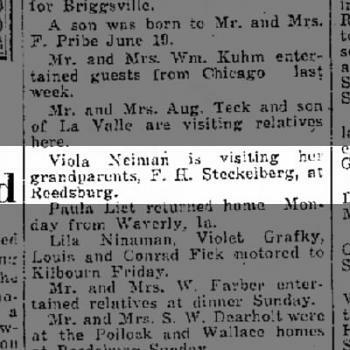 Viola Niemann graduated in 1931 at Reedsburg High School, Reedsburg, Sauk, Wisconsin. Floyd Harris was born on 30 April 1907 at Wisconsin. He married Martha A. Niemann, daughter of Henry George Niemann and Emma Dorothea Steckelberg, circa 1930. Floyd Harris died on 30 April 1990 at age 83. Floyd Harris Jr. married Joanne (?). Floyd Harris Jr. was born on 21 August 1930 at Wisconsin. He was the son of Floyd Harris and Martha A. Niemann. Floyd Harris Jr. died on 20 September 2017 at age 87. Arthur Baryenbruch was born in 1895. He married Valeria M. Doyle on 11 October 1921. Arthur Baryenbruch died in 1964. Michael Baryenbruch was the son of Arthur Baryenbruch and Valeria M. Doyle. Name Variation James Wipperfurth was also known as Wipperlurth. James Wipperfurth married Helen Alt, daughter of Robert Alt and Anna Frances Ringelstetter, before 1965. (?) Daughenbaugh married Alice Greenheck, daughter of Arnold Greenheck and Rosina M. Hutter, before 1961. 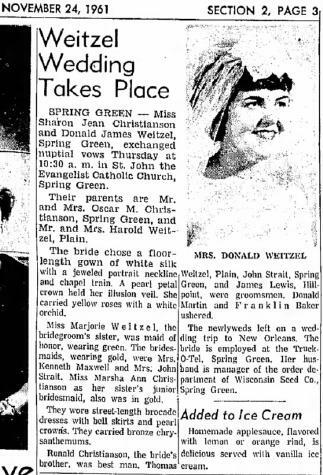 Married Name 23 November 1961 As of 23 November 1961,her married name was Weitzel. Sharon Jean Christianson was the daughter of Oscar M. Christianson and (?) Martin. 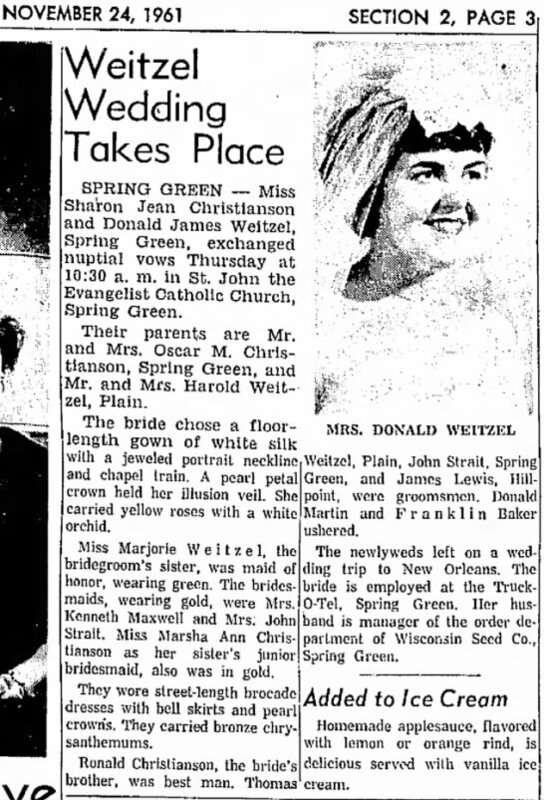 Sharon Jean Christianson married Donald James Weitzel, son of Harold J. Weitzel and Teresa E. Volk, on 23 November 1961. Oscar M. Christianson married (?) Martin. Oscar M. Christianson died after 1972. Marsha Ann Christianson was the daughter of Oscar M. Christianson and (?) Martin. 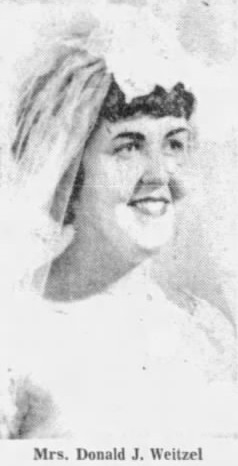 Marsha Ann Christianson witnessed the marriage of Sharon Jean Christianson and Donald James Weitzel on 23 November 1961. Ronald Christianson was the son of Oscar M. Christianson and (?) Martin. Ronald Christianson witnessed the marriage of Sharon Jean Christianson and Donald James Weitzel on 23 November 1961. (?) Price married Gertrude Hickcox, daughter of Edward M. Hickcox and Elizabeth (?). (?) Klosterman married Sadie Grace Hickcox, daughter of Edward M. Hickcox and Elizabeth (?). (?) Bennett married Amy A. Hickcox, daughter of Edward M. Hickcox and Elizabeth (?). Russell H. Stehr was born on 12 September 1918. He was the son of G. H. Stehr. Russell H. Stehr died on 1 March 2006 at age 87 Russell H. Stehr, age 87, of Oshkosh, passed away on Wednesday, March 1, 2006, at the Mercy Medical Hospital. Russell was born to Gustave and Edna (Watzke) Stehr on Sept. 12, 1918, in Cottage Grove. He graduated from Madison East High School in the June class of 1936. He served in World War II from August 1941 to May 1945. He received a Bronze Star for support of combat operations in North Africa and Italy. As a staff sergeant he established a exceptionally high standard of vehicular performance and maintenance in his organization. He was a member of the American Legion Post No. 70 in Oshkosh. Russell married Elizabeth A. Richardson in Spring Green, on May 26, 1962. Russell worked for several implement companies in the Madison area and Oshkosh. He retired 16 years ago from Mercury Marine Plant 6 Division of Brunswick Corporation. He is survived by his wife, Elizabeth Stehr of Oshkosh two sisters-in-law, Ann Stehr of Milwaukee, and Nell Stehr of Grafton, four nephews, three nieces, other relatives and friends. He was preceded in death by his parents, two brothers, Melvin and Kenneth Stehr; and a sister, Clara Gill. Funeral services will be held on Saturday, March 4, 2006, at 1 p.m. at the RICHARDSON-STAFFORD FUNERAL HOME in Spring Green. The Rev. Herb Bowers will officiate with burial in the Spring Green Cemetery. Visitation will be held on Saturday at the funeral home from 12 noon until the time of service. The Richardson-Stafford Funeral Home is assisting the family with the arrangements. Kenneth Stehr was the son of G. H. Stehr. James Klebesadel was born on 19 May 1926. He died on 7 February 2008 at age 81. (?) Terness married Bernadine Agnes Nondorf, daughter of Bernard Nondorf and Elizabeth Louise Schauf.